I heard Harry Manx a few years back and instantly dug his performance, which was concert footage from Australia. Manx’s rich slide guitar playing had a powerful enchantment. Steve Marriner, of the raucous swamp blues outfit MonkeyJunk, is a frequent Manx collaborator, and judging from Hell Bound for Heaven, the duo’s first album release, I gather he too is a tremendous musician. Manx was born on the Isle of Man but grew up mainly in Ontario. In the 1970s, he traveled in Europe, busking to support himself. Then in the 1990s, he traveled to India to study the Mohan Veena with V.M. Bhatt (who recorded A Meeting by the River with Ry Cooder in 1993). 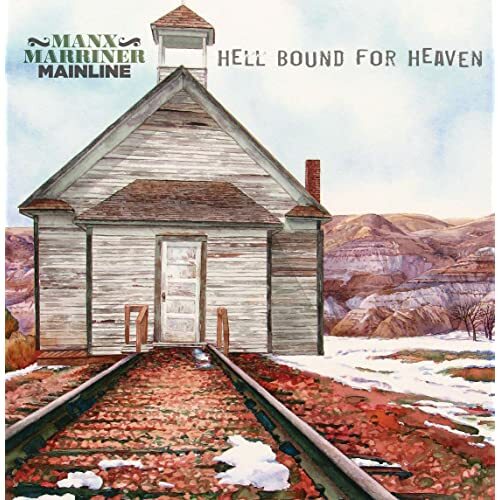 Among Manx’s album highlights are Wise and Otherwise from 2002, West Eats Meet and Mantras for Madmen from 2005, and Bread and Buddha from 2009. His work has been compared with fellow slide players Kelly Joe Phelps and Ry Cooder. Multi-instrumentalist Marriner, meanwhile, along with Tony D and Matt Sobb, is a mainstay with the Ottawa-based blues-rock band MonkeyJunk. The trio broke onto the international blues scene in 2009 and won the 2010 Blues Music Award for Best New Artist Debut for their first release, Tiger In Your Tank, beating out some formidable talent. Their second album, To Behold, won the Juno Award (Canadian Grammy) for Blues Album of the Year. Their 2013 release, All Frequencies, leaned toward rhythm and blues but was also excellent. In 2015 they released Moon Turn Red and then Time to Roll in 2016.